Christmas BBQ in the backyard? Done! One of the best things about living in Houston is that it’s warm enough to entertain outdoors year-round. Of course, before you host that perfect party, you need somewhere for your guests to sit. Imagine spending your summers on the patio relaxing with guests (and a little bit of barbecue) or enjoying autumn nights having drinks around the fire pit with friends. For that, check out our outdoor sectionals, sets, and tables. This outdoor rectangle dining table is a casual contemporary addition to your backyard retreat. Wood grain look of the porcelain top speaks of natural beauty. Designer base with rust-proof aluminum keeps its appeal in all-weather conditions. Up to six people sit comfortably around its rectangular profile. Your backyard or patio has never been so stylish than with the Town Court 5-piece firepit set. The slatted fire pit table looks like slightly distressed wood but is actually crafted from durable, weather-resistant aluminum for years of enjoyment. The propane fire bowl conveniently ignites at the push of a button. The included burner cover transforms the fire pit into a coffee table, perfect for all your entertainment needs. Enjoy high-backed comfort and carefree outdoor living with the coordinating spring action lounge chairs. Roomy and spacious, the rocking action is sure to set the tone for relaxation. The round fire pit table outdoor is a casual contemporary addition to your backyard retreat. Wood grain look of the round porcelain top speaks of natural beauty. Resin wicker base with rust-proof aluminum frame keeps its appeal in all-weather conditions. Light up and adjust the flame in style. Taking style and durability to a higher level, this outdoor sofa is designed to make indoor-outdoor living a royal pleasure. Crisp and clean, the dark brown-finished aluminum frame is rust free and full of contemporary flair. Indulgently thick and plush, the easy clean, light gray cushions only look high maintenance. Taking style and durability to a higher level, our loveseat glider is designed to make alfresco living a royal pleasure. The dark brown-finished aluminum frame with a hint of distressing is rust proof and full of contemporary flair. Indulgently thick and plush, the easy clean light gray cushions only look high maintenance. 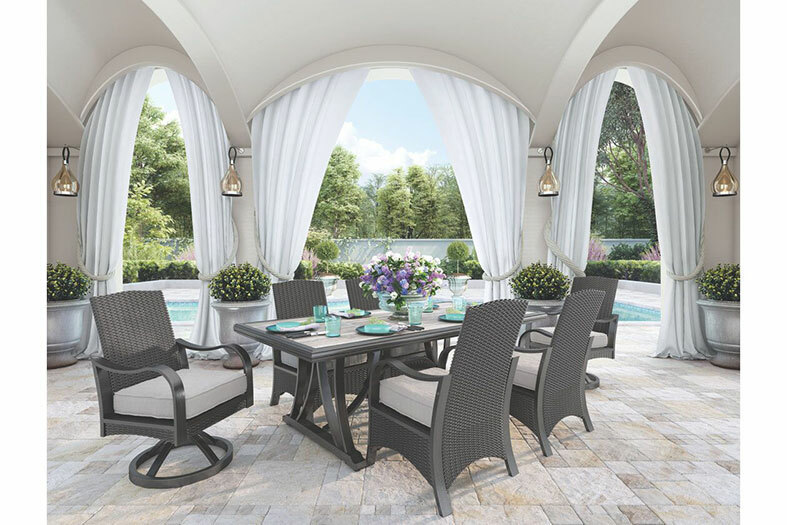 The Marsh Creek outdoor dining table is a casual contemporary addition to your backyard retreat. Wood grain look of the porcelain top speaks of natural beauty. Keep calm and cool under the optional umbrella feature that accompanies this dining table to make your social gathers a day to never forget. The Partanna Barstools mix form and function in such a stylish way. Chevron-woven wicker chair back and all-weather cushion has the feel of velvet to help while away the hours. The all-weather powder coated rust-resistant aluminum frame offers years of support. Comfortable and carefree sums up the beauty of the Abbot Court Lounge Chair. The uniquely woven wicker chair is softened with all-weather cushions. Outdoor wicker is shaded like driftwood, without worries of splintering, cracking or further fading. This lovely round outdoor cocktail table invites you to gather round in style. An essential for outdoor entertaining, this elegant table sports a pretty and practical lattice top that allows rainwater to drain quickly. Durable cast aluminum is crafted to weather the seasons beautifully. Enjoy high-backed comfort and carefree outdoor living with the Spring Lounge Chairs. Roomy and spacious, the rocking action is sure to set the tone for relaxation. Be it for entertaining or everyday use, our rectangular outdoor coffee table is a royally handy addition to your outdoor living space. Durable and rust proof, the dark brown-finished aluminum construction with a hint of distressing is made for season after season of enjoyment. Includes slat-style top and shelf for easy water drainage. Be it for entertaining or everyday use, our outdoor square end table is a royally handy addition to your outdoor living space. Durable and rust proof, the dark brown-finished aluminum construction with a hint of distressing is made for season after season of enjoyment. Includes slat-style top and shelf for easy water drainage. With its subtly rounded profile, the Burnella Armless Chair does invite you to gather round in style. The lasting cast aluminum construction on this sectional makes any outdoor gathering more enjoyable while the high-performance seat and back cushions secure to the frames and reverse for twice the wear. The Marsh Creek dining chair is a casual contemporary addition to your backyard retreat. Extended back makes it beautiful from the front and behind. Resin wicker infuses impeccable tactility with the rust-proof aluminum frame. Durable seat cushion provides comfort and neutral style. The Marsh Creek rectangular cocktail table is a casual contemporary addition to your sunroom or backyard retreat. Wood grain look of the porcelain top speaks of natural beauty. Designer base made of rust-proof aluminum keeps its appeal in all-weather conditions. The Marsh Creek square end table is a casual contemporary addition to your sunroom or backyard retreat.Wood grain look of the porcelain top speaks of natural beauty. Designer base made of rust-proof aluminum keeps its appeal in all-weather conditions.